Synthetic biology is the new frontier of genetic engineering. By changing the genes inside of a cell, you can program it to do novel and useful functions that it otherwise could not. Cellular immunotherapy, the newest hope in cancer treatment, is a example of the rising important of synthetic biology in our lives. Our team is composed of bioengineers, biochemists, and hackers who care about expanding STEM knowledge to all those who are interested in it. Learning how to build genetically modified organisms isn't so tough-- high school and college teams compete in synthetic biology "hacking" events such as iGEM the same way hackers compete in Dubhacks. For many, it's how they discover their love for biology and engineering. However, without the resources of a laboratory, mentors, and funding, there is no way for most interested students to find out what synthetic biology is. 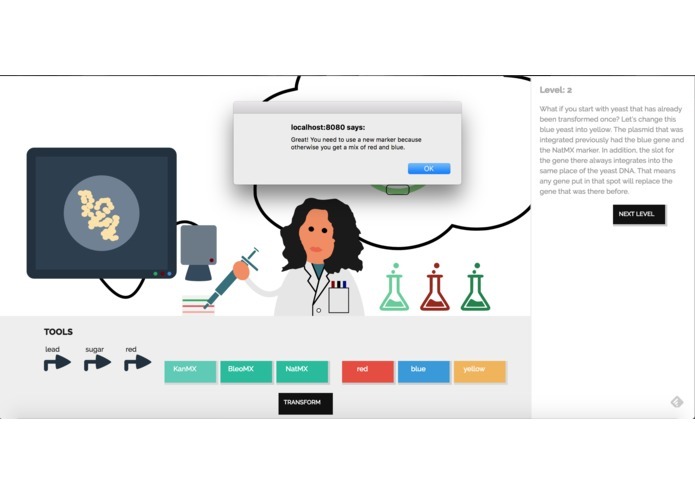 Playsmid is an interactive way to dive into the basics of synthetic biology design without ever having to pick up a pipette or put on a lab coat. By teaching synthetic biology logic through a game, even those with no biology knowledge can start learning how to make their own novel organisms. Playsmid models the process of designing and integrating a plasmid (circular piece of DNA) to engineer yeast cells. The puzzles included in Playsmid allow you to build up your knowledge in synthetic biology-- Begin with simple color outputs and advance into detecting and amplifying molecular signals. If you are a researcher or educator, you can add your own repository of genetic parts to our crowdsourced database and show students how to build strains in a engaging, visual format. Playsmid is your genetic playground! We want to build a sandbox mode with a larger repository of genetic parts. 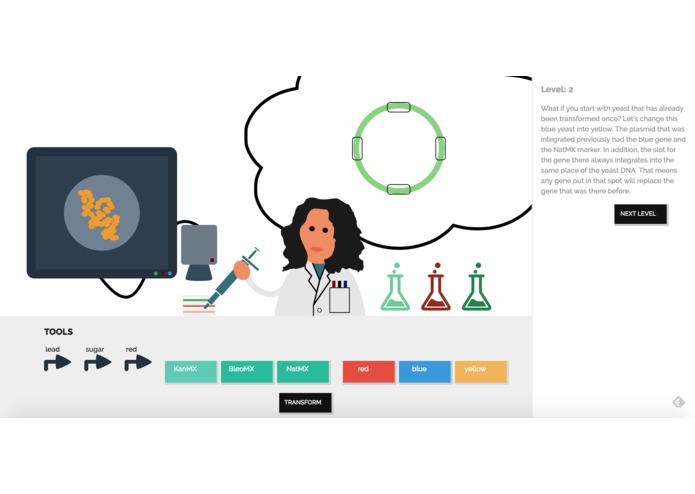 After mastering the puzzle set, students can build their own strains or virtually model ideas they have in our user-friendly interface. Set up the backend server and hooked it to the frontend. Developed the UI and the game engine. Backend, some frontend stuff, some other things.